Unam Sanctam Catholicam: "Upon Saint Crispin's Day"
Today, October 25th, the Feast of St. Crispin, marks one of the most pivotal battles in European history: the battle of Agincourt between the French and the English on this day in 1415. This battle (though of no real significance to the Catholic Church because it was a battle between two Catholic nations) gave the decisive upper hand to the English in the Hundred Years' War and delivered much of France into their hands. King Henry V of England, after a successful but prolonged seige of Harfleur ending on September 22nd, decided to move his weary army back to Calais to rest and wait out the winter (in the Middle Ages, campaigning season went from April to late September only). The French under Charles d'Albret were in a position to cut the English off from their intended retreat, which they shortly did by positioning themselves between Harfleur and Calais. By doing so, d'Albret hoped to force a confrontation with Henry. The situation looked grim, as Henry's force was weary from 260 miles of marching and was suffering from shortage of food and dysentery, while d'Albret's force was fresh. Henry was not enthusiastic about engaging the French, but his supply lines to Calais had been cut off and he had no other choice. Estimates of the forces involved vary from 6,000 to 9,000 for the English, and from about 15,000 to about 36,000 for the French. All historians agree that the English were badly outnumbered, at least three to one. The battle was fought in the narrow strip of open land formed between the woods of Tramecourt and Agincourt. The French army was positioned by d'Albret at the northern exit so as to bar the way to Calais. The night of 24 October was spent by the two armies on open ground, and the English had little shelter from the heavy rain. Henry ordered all his men to keep perfectly quiet so that everybody could get a good night's rest; indeed, they were so quiet that the French thought the English had retreated. The decisive factor in the battle was terrain. The French had chosen the position, a large field that had been freshly plowed and made muddy by the rain of the previous night. The English were not anxious to press the fight, and Henry set up in the traditional English formation of several ranks of men-at-arms wedged in by archers, and the whole line protected by rows of sharpened spikes driven into the ground to ward off cavalry. For the morning of the battle, the armies just stared at each other, neither liking the prospects of charging across the damp field. The rains had left the turned up soil damp and the French knew it would turn to mud under the heavy gallop of the horses and the march of the French men-at-arms. Finally, Henry forced the battle by moving his line forward and opening fire on the French with his longbowmen. The French made a furious assault on the English lines, but they were hampered by the mud, into which many of them fell to die by drowning, trampling or suffocation. The English longbowmen ultimately repelled them, and French reinforcements were brought up. Unfortunately, the field was too narrow to accomodate all of the French forces and the French were packed so tightly that some could barely use their weapons. The English longbowmen rained down death upon them, then joined the men-at-arms in making a general slaughter of the French. The latter only had to be pushed over into the mud, where they would most likely by trampled or drown from the weight of their armor. The French had suffered a staggering defeat, both in numbers and in the amount of nobles lost in the battle. The Constable d'Albret, three dukes, five counts and 90 barons were among the dead, and a number of notable prisoners were taken, amongst them the Duke of Orléans and Jean Le Maingre, Marshal of France. English losses were low, somewhere between 150 and 450. But the French losses were immense, somewhere between 7,000 and 10,000 men. Seldom in history had such a one-sided victory been won. 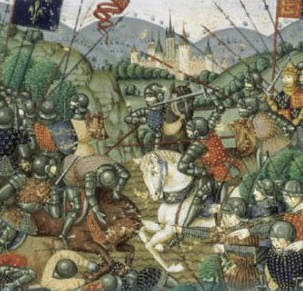 The battle that Henry V had been reluctant to fight and only did so in order to get to the coast turned out to be pivotal in the war with France. Henry was able to fulfil all his objectives thereafter. He was recognised by the French in the Treaty of Troyes (1420) as the regent and heir to the French throne. This was cemented by his marriage to Catherine of Valois, the daughter of King Charles VI. Despite these facts, the war, as we know, did not turn out well for the English in the end. Henry V died suddenly in 1422 from what appeared to be dysentery, and his young son Henry VI by Catherine was then only a few months old. Charles VI of France, whom Henry had hoped to succeed, actually outlived him by several months and was succeeded by his own son, Charles VII (though he was not crowned until 1429). Incidentally, following death of Henry V, his widow Catherine would secretly marry or have an affair with a Welsh courtier, Owen Tudor, and they would be the grandparents of King Henry VII of England. Furthermore, we know that it was in the reing on Charles VII that St. Joan of Arc was raised up by God to drive the English from France and put and end to the Hundred Years' War. It was Joan's victories that allowed Charles VII to be crowned at Rheims in 1429. Following the defeats of the English under Joan, and the inept rule of England by the young Henry VI, England was plunged into the fratricidal Wars of the Roses that only terminated with the ascension of Henry Tudor (Henry VII) after the Battle of Bosworth Field in 1485. And we all know what good the Tudors did England. "If we are mark'd to die, we are now to do our country loss; and if to live,The fewer men, the greater share of honour. God's will! I pray thee, wish not one man more. By Jove, I am not covetous for gold,Nor care I who doth feed upon my cost; It yearns me not if men my garments wear; Such outward things dwell not in my desires. But if it be a sin to covet honour,I am the most offending soul alive. No, faith, my coz, wish not a man from England. God's peace! I would not lose so great an honour As one man more methinks would share from meFor the best hope I have. O, do not wish one more! Rather proclaim it, Westmoreland, through my host,That he which hath no stomach to this fight,Let him depart; his passport shall be made, And crowns for convoy put into his purse; We would not die in that man's company that fears his fellowship to die with us. This day is call'd the feast of Crispian. He that outlives this day, and comes safe home,Will stand a tip-toe when this day is nam'd,And rouse him at the name of Crispian. He that shall live this day, and see old age,Will yearly on the vigil feast his neighbours,And say 'To-morrow is Saint Crispian. 'Then will he strip his sleeve and show his scars,And say 'These wounds I had on Crispian's day. 'Old men forget; yet all shall be forgot, But he'll remember, with advantages,What feats he did that day. Then shall our names, Familiar in his mouth as household words-Harry the King, Bedford and Exeter,Warwick and Talbot, Salisbury and Gloucester-Be in their flowing cups freshly rememb'red.This story shall the good man teach his son. And Crispin Crispian shall ne'er go by, From this day to the ending of the world,But we in it shall be remembered-We few, we happy few, we band of brothers;For he to-day that sheds his blood with meShall be my brother; be he ne'er so vile,This day shall gentle his condition; And gentlemen in England now-a-bed shall think themselves accurs'd they were not here, And hold their manhoods cheap whiles any speaks that fought with us upon Saint Crispin's day."